Discover Orlando's Most Convenient Hotel! Located in the Florida Mall just minutes from the Orlando International Airport, The Florida Hotel & Conference Center, BW Premier Collection provides the perfect home base for business or leisure. 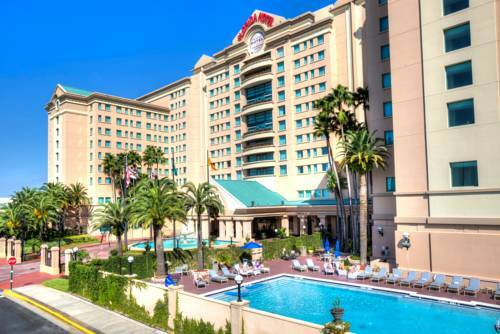 Close to the Orange County Convention Center, Universal Studios and Walt Disney World Resort, we are at the center of everything there is to do in Central Florida. Stay with us and immerse yourself in luxury and comfort as our knowledgeable, helpful staff assist you in completing business or enjoying your vacation. Experience our exceptional features that include 511 well-equipped rooms with either a king-size or two queen-size beds. Starbucks , Cricket's Bar and Marcelo's Bistro are conveniently located in our lobby. We have state-of-the-art meeting, event and convention facilities, friendly service, an exceptional new business center, heated pool and whirlpool as well as day spa services. You can keep your fitness routine regular with our state-of-the-art Life Fitness facility. We are ranked among the top hotels in Orlando by TripAdvisor . We are connected to The Florida Mall featuring Macy's , Dillard's, JC Penney , American Girl , Crayola Experience , Apple, Microsoft and over 250 more stores. There is a Food Court in the mall, as well as many close by restaurants including Chili's, Red Lobster, Buca di Beppo, Panera Bread , Miller's Ale House, Carlo's Bake Shop and many more. Starbucks , on premises, Cafe, American, Open for: breakfast, lunch, dinner, Located in our lobby and open daily from 6:00 a.m. - 9:00 p.m.
Lake - 15.4 mile(s) from ESPN Wide World of Sports, a 220 acre athletic complex located in the Walt Disney World Resort, in Bay Lake, Florida, near Orlando, Florida. Camping - 6.5 mile(s) from Camping World Stadium, a stadium in Orlando, Florida. The stadium is located in the West Lakes neighborhoods of Downtown Orlando and is home to The Orlando City Lions and Orlando Pride. Beach - 58.3 mile(s) from Daytona Int'l Speedway, a race track in Daytona Beach, Florida, United States. Since opening in 1959, it has been the home of the Daytona 500, the most prestigious race in NASCAR . 5.7 mile(s) from The Mall at Millenia, an upscale, contemporary, indoor shopping mall located in Orlando, Florida just off of Interstate 4 at Conroy Road near the northern end of International Drive. 5.0 mile(s) from International Drive, also known at I-Drive Resort Area. 0.00 mile(s) from The Florida Mall , attached to The Florida Hotel, and it offers over 270 specialty shops and dining. 5.7 mile(s) from Orlando Premium Outlets, dozens of brand-name fashion, accessory & housewares shops fill a landscaped, open-air outlet mall. 11.5 mile(s) from Disney Springs, an outdoor shopping, dining, and entertainment complex at the Walt Disney World Resort. 4.3 mile(s) from Darden, the premier full-service dining company, operating over 1500 locations. 5.2 mile(s) from PepsiCo Inc., an American multinational food, snack and beverage corporation with interests in the manufacturing, marketing, and distribution of grain-based snack foods, beverages, and other products. 5 mile(s) from Lockheed Martin, an American global aerospace, defense, security and advanced technologies company with worldwide interests. 2.7 mile(s) from Cox Automotive , specializes in auction services for registered automobile dealers. 4.8 mile(s) from Goya , a family-run food company offering beans, rice, nectars, seasonings and authentic Spanish, Mexican and Hispanic specialties. 8.8 mile(s) from Valencia College, a public state college in Orlando, Florida, United States. In 2011, it was named the top community college in the United States by the Aspen Institute. 24.1 mile(s) from Univ. of Central FL, an American public research university in Orlando, Florida. It is the largest university in the United States by undergraduate enrollment, and the second largest by total enrollment. 6.8 mile(s) from SeaWorld Orlando, offers roller coasters, rides, shows, tours, attractions & family-friendly activities for thrill seekers and animal lovers. 50.2 mile(s) from Kennedy Space Center , visit NASA's launch complex, astronaut hall of fame, or see a rocket launch all just an hour from Orlando. 5 mile(s) from IDrive 360, Orlando's newest entertainment destination. Home of the 400-foot Orlando Eye featuring attractions, restaurants, live entertainment and shopping. Conveniently located on International Drive with free parking. 6.4 mile(s) from Discovery Cove , swim with dolphins, snorkel through colorful reefs teeming with thousands of tropical fish, explore underwater shipwrecks, and grottos. 6.2 mile(s) from The Holy Land Experience, a Christian theme park in Orlando, Florida and registered non-profit corporation. HLE conducts weekly church services and bible studies for the general public. 10.5 mile(s) from Harry P. Leu Gardens, semi-tropical and tropical gardens that contain nearly 50 acres of landscaped grounds and lakes, with meandering trails shaded by 200-year-old oaks and forests of camellias. 3.1 mile(s) from Ripley's Believe It or Not , a museum with kitschy oddities on display, including shrunken human heads & rare animal skeletons. 0.01 mile(s) from Crayola Experience Orlando, a new hands-on attraction at the Florida Mall with more than 25 activities for kids and families. 15.8 mile(s) from Old Town Kissimmee, a walking district full of shops, rides, food & entertainment. Classic car shows are a popular event. 9.5 mile(s) from Orlando Science Center, a private science museum located in Orlando, Florida. Its purposes are to provide experience-based opportunities for learning about science and technology and to promote public understanding of science.